If you’re British, female and currently aged between 25 and 30, the chances are pretty good that you were, like, crazy mad in love with Take That as a teen. You may even have a classy tattoo somewhere on your person – perhaps Gary Barlow’s cherub-like face on your ankle, or Robbie’s cheeky mug gurning out from your left arse cheek. A nation of oestrogen-crazed fans were left devastated in 1996 when the group split, but they reformed sans Robbie earlier this decade and once again have dominated the charts, knocking the likes of Beyonce and the Kaiser Chiefs off the top spot. This is all great news for SingStar: Take That, as the group now has a whole new wave of screechy younger fans in addition to the followers of old. 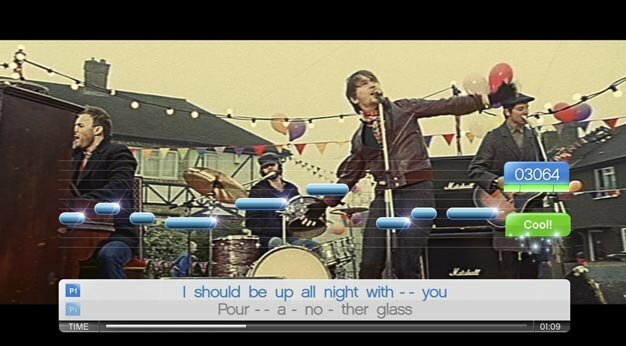 The latest version of the popular PlayStation karaoke game aims to please both sets of fans, as it includes tracks from their older albums as well as the new ones. 24 songs are included in all. All can be performed in versus, solo and duet modes although only a few of them are actual duets – the rest simply let you take it in turn singing alternate lines with a friend in duet mode. SingStar: Take That works in exactly the same way as previous versions – it’s a stand-alone game, so you don’t need to own another SingStar title to use this one, but you will obviously need some mics if you want to actually sing and not just stare at the hot, naked, bulging torsos of foppy-haired men. There doesn’t seem to be a version of SingStar: Take That that comes bundled with mics at the moment, but you can buy them separately anyway (including the dapper new wireless ones). Presentation is typically excellent and all the older videos are all crisp and pleasing to watch, especially if you like lingering shots of guys twirling around on beaches and thrusting their pectorals into your face. Mr Barlow and co decided to keep some clothes on for their newer releases – a blessed relief if you’re a slightly pudgy and envious games junkie – and the production values were massively ramped up for the likes of Greatest Day. Now you just get wistful gazing into the distance, and expressions that vary between time-weathered weariness and apparent boredom. Regardless, the visuals are great and the sound is clean, as you’d expect from a SingStar game. 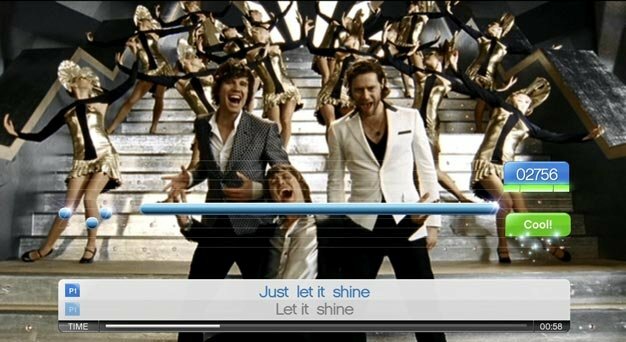 Take That lovers with a PlayStation 2 or 3 should at the very least throw SingStar: Take That on their list for Santa. Even Take That haters will likely relent after a couple of beers and join in, and the group’s excessive radio coverage means that everyone at least should know the choruses to the majority of tracks. Just be prepared for lots of lyrics along the lines of ‘Ohh-ohhhhh, woooooah’ and ‘Yeeeeaaaaah, ohhhhh, yeah-hehh bayyyy-beeeeeee’.